Location: The Knarsdale Estate is situated at the north western end of the Pennines. Within a 15 mile radius of Knarsdale, there are a number of other renowned moors including Whitfield, Garrigill, East and West Allenheads and Croglin. About your host at KNARSDALE ESTATE: James Chapel, Sporting Agent. William Powell Sporting is all about providing an exceptional level of personal service ensuring the client receives the right advice on the best sporting opportunities for them and then the implement action of this. We have now been involved in the sporting world for over 20 years. Not just letting shooting and fishing but actually running sporting properties on a day-to-day basis. This means we have been lucky enough to visit a vast number of sporting locations and every shoot, fishery or deer forest we recommend has been personally visited beforehand. As a result we have an unrivalled knowledge of the places we recommend to our clients. ­­­­­­Game shooting experience at KNARSDALE ESTATE: The Knarsdale and Asholme Estate extends to nearly 17,000 acres. It is recognised as one of the best grouse moors in England due to both the large annual bags achieved in recent years and it’s terrain which produces very challenging driven grouse shooting. The area of moorland under management at Knarsdale for Grouse production on the west side of the south Tyne valley extends to about 11,500 acres. 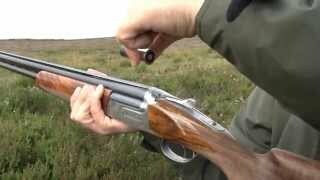 Knarsdale Moor is managed as four distinctive beats which provide 3 ½ separate days driven shooting. There are 19 lines of grouse butts providing options to cater for a variety of different of wind directions. The majority of butts are of sunken stone or timber construction. It is customary to shoot 9 guns at Knarsdale. However, there are a minimum of 10 butts in each row to provide flexibility of gun positioning. Asholme and East End Moors are situated on the east side of the valley provide of a further 2 ½ days driven shooting. The Knarsdale Moors are well served with a network of good access roads. These are all easily passable by four-wheel drive vehicles. Click here for quick link country guide. Lying at the heart of the Estate with great views of the surrounding Moorland, Knarsdale Hall is a large stone-built lodge. Over the last few years the building has undergone major refurbishment and now provides accommodation of a very high standard, in 10 bedrooms, eight of which are served by en-suite bathrooms with showers and two have en-suite shower rooms only. Please contact the host to book your accommodation. by car or public transport to KNARSDALE ESTATE.